Both saltwater- and freshwater-dwelling turtles lay their eggs in nests that they dig in the ground. Because these nests are below the level of the soil or sand into which they dig them, and because turtles make an attempt to hide the locations of their nests, the sites where eggs are incubating are often hard to discern. The female sea turtle generally digs her nest in the sand, using her rear flippers to create a roughly round hole in the surface. She then lays a clutch of eggs, the number varying according to species, in the hole. Eggs are usually white and quite round, looking somewhat like golf balls in appearance. She then covers the nest entirely with sand and disguises the area around it by brushing sand over a wide area with her front flippers. Land turtles usually dig their nests into dirt rather than sand. Turtle nests are located in sand, if the mother is a sea turtle, and in dirt and along the sides of river banks or areas near swamps or ponds in the case of freshwater turtles. Sea turtles usually nest in roughly the same areas where they themselves hatched -- within 5 to 35 miles of their own hatching sites. Turtles nest in a variety of locations, from temperate and tropical to subtropical regions. Nest depth varies by species. Snapping turtles (Chelydra serpentina), for instance, dig nests between 5 and 7 inches deep, but the depth of the hole depends on the size of the turtle, since it is usually as deep as the mother can reach with her flippers. 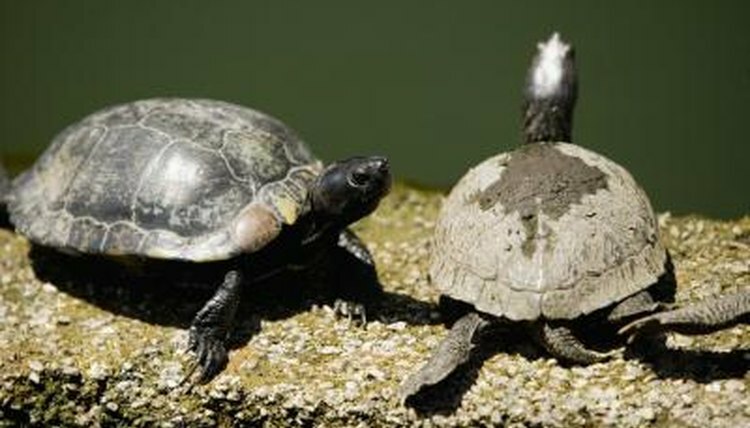 Depending on species, turtles nest at different frequencies. Snapping turtles, for instance, usually lay their eggs in June. Loggerhead turtles (Caretta caretta) nest two to three times per year, while green turtles (Chelonia mydas) do so three to four times a year. Both lay at two- to three-week intervals. Leatherbacks nest considerably more frequently, five to seven times a year about 10 days apart. However, they only nest every two or three years. When baby turtles are finished incubating, a process that can span a wide range of times depending on species and weather conditions, they usually emerge and head for a water source. Leatherback turtle embryos, for instance, incubate for about 45 days before heading to the ocean. Snapping turtle hatchlings may emerge at any time during the year their mother lays them, or even the following spring. Green turtle hatchlings incubate for approximately two months. How Can You Tell if Your Box Turtle Is Digging Her Nest?